This course is presented by Mike Chantler. This is a 100% coursework assessed course. An example of a previous year’s project is here. 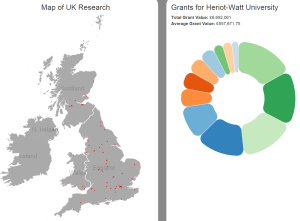 The data for 2014/2015 projects are taken from Gateway to Research. An example project is here. Preprocessing of the data for dimensionality reduction maybe required e.g. as used for our Research Perspectives project which sumarises 180,000 project descriptions available from GTR and NSF. For more information see the course on Vision.